Log Stores - Hillsborough Fencing Ltd.
For those who use the garden a lot, whether that’s for social events or just relaxing with family, the style of a garden is essential. And for those who are avid gardeners and/or architects, scraps of wood in the garden might be a problem. 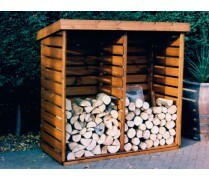 We’ve created a range of stylish log stores to ensure all of your material has a place, without your garden looking cluttered.